This book describes how to use Caché XML tools. Caché brings the power of objects to XML processing  you can use objects as a direct representation of XML documents and vice versa. Because Caché includes a native object database, you can use such objects directly with a database. 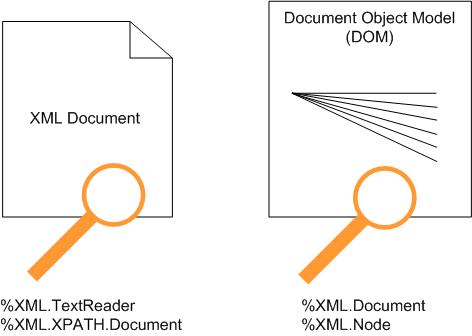 Furthermore, Caché provides tools for working with XML documents and DOMs (Document Object Model), even if these are not related to any Caché classes. Some of the Caché XML tools are intended for use mainly with XML-enabled classes. To XML-enable a class, you add %XML.Adaptor to its superclass list. The %XML.Adaptor class enables you to represent instances of that class as XML documents. You add class parameters and property parameters to fine-tune the projection. Because there are so many options, an entire book is devoted to them: Projecting Objects to XML. Contained in class instances. Depending on the class, the data can also possibly be saved to disk, where it is available in all the same ways as other persistent classes. Contained in XML documents, which could be files, streams, or other documents. Contained in a DOM (Document Object Model). 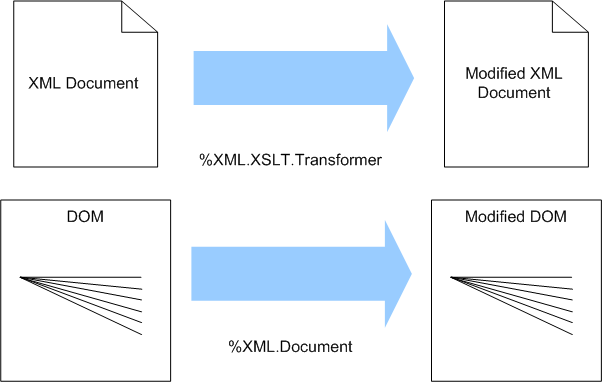 The Caché XML tools provide many ways to access data in and modify both XML documents and DOMs. You can also use Caché XML tools to create and work with arbitrary XML  that is, XML that does not map to any Caché class. To create an arbitrary XML document, use %XML.Writer. This class provides methods for adding elements, adding attributes, adding namespace declarations, and so on. To create an arbitrary DOM, use %XML.Document. This class provides a class method that returns a DOM with a single empty node. Then use instance methods of that class to add nodes as needed. Or use %XML.Reader to read an arbitrary XML document and then create a DOM from that document. For a DOM, you can use methods of %XML.Document to modify the DOM. For example, you can add or remove elements or attributes. Caché XML Tools use the Caché SAX (Simple API for XML) Parser. This is a built-in SAX XML validating parser using the standard Xerces library. SAX is a parsing engine that provides complete XML validation and document parsing. Caché SAX communicates with a Caché process using a high-performance, in-process call-in mechanism. Using this parser, you can process XML documents using either the built-in Caché XML support or by providing your own custom SAX interface classes within Caché. If the output destination is a file or a binary stream, the default is "UTF-8". On a Unicode Caché system, the default is "UTF-16". On an 8bit Caché system, the default is the default character set of the locale. If the document is a file or a binary stream, Caché assumes that the character set is "UTF-8". On a Unicode Caché system, Caché assumes the character set is "UTF-16". On an 8bit Caché system, Caché assumes the character set is the default character set of the locale. For background information on character translation in Caché, see Localization Support in the Caché Programming Orientation Guide. Literal means that the document is a literal copy of the object instance. In most cases, you use literal format, even when working with SOAP. Except where otherwise noted, the examples in the documentation use literal format. Encoded means encoded as described in the SOAP 1.1 standard or the SOAP 1.2 standard. For links to these standards, see Standards Supported in Caché, later in this chapter. The details are slightly different for SOAP 1.1 and SOAP 1.2. The following subsections show the differences between these document formats. The root element of the output includes declarations for the SOAP encoding namespace and other standard namespaces. This document includes person, address, and doctor elements all at the same level. The address and doctor elements are listed with unique IDs that are used by the person elements that refer to them. Each object-valued property is treated this way. The names of the top-level address and doctor elements are named the same as the respective classes, rather than being named the same as the property that refers to them. Encoded format does not include any attributes. The GroupID property is mapped as an attribute in the Person class. In literal format, this property is projected as an attribute. In the encoded version, however, the property is projected as an element. Collections are treated differently. For example, the list element has the attribute ENC:arrayType. Each element has a value for the xsi:type attribute. For SOAP 1.1, the SOAP encoding namespace is "http://schemas.xmlsoap.org/soap/encoding/"
For SOAP 1.2, the SOAP encoding namespace is "http://schemas.xmlsoap.org/wsdl/soap12/"
It verifies whether the XML document is well-formed. It attempts to validate the document, using the given schema or DTD. The validation fails unless these other schemas are available to the parser. Especially with WSDL documents, it is sometimes necessary to download all the schemas and edit the primary schema to use the corrected locations. It attempts to resolve all entities, including all external entities. (Other XML parsers do this as well.) This process can be time-consuming, depending on their locations. In particular, Xerces uses a network accessor to resolve some URLs, and the implementation uses blocking I/O. Consequently, there is no timeout and network fetches can hang in error conditions, which have been rare in practice. Also, Xerces does not support https; that is, it cannot resolve entities that are at https locations. SOAP 1.1 encoding as specified by section 5 of the SOAP 1.1 standard. SOAP 1.2 encoding as specified by section 3 Part 2: Adjuncts (http://www.w3.org/TR/soap12-part2/) of the SOAP 1.2 standard. For more information on SOAP, see the W3 web site (for example, http://www.w3.org/TR/2003/REC-soap12-part1-20030624/). XML Canonicalization Version 1.0 (also known as inclusive canonicalization), as specified by http://www.w3.org/TR/xml-c14n. Caché supports key encryption using RSA-OAEP or RSA-1.5 and data encryption of the message body using AES-128, AES-192, or AES-256. The Caché SAX Parser uses the standard Xerces-C++ library, which complies with the XML 1.0 recommendation. For a list of these standards, see http://xml.apache.org/xerces-c/. The Xalan processor supports XSLT 1.0. The Saxon processor supports XSLT 2.0. For information on additional standards related to web services and clients, see Creating Web Services and Web Clients in Caché and Securing Caché Web Services. For information on the character sets expected in XML, see the W3 web site (http://www.w3.org/TR/2006/REC-xml-20060816/#charsets). If you have enabled support for long string operations, an attribute can be larger than 32 KB. Otherwise, each attribute must be less than 32 KB. Also, Caché XML does not support, within one element, multiple attributes with the same name, each in a different namespace.